Field descriptions anyone? This is a fairly minor update, although we like responsive horizontal slicers, and there are some exciting things coming up in preview mode. When you resize a normal horizontal slicer, the buttons just get bigger. 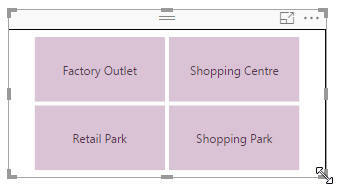 The same slicer resized: now I have to scroll right to see Shopping Park. Enable this property to change the way that slicers resize (this property is only available for horizontal slicers). This slicer is exactly the same size as the one above, but Power BI Desktop is adjusting the number of rows and columns as you resize it. 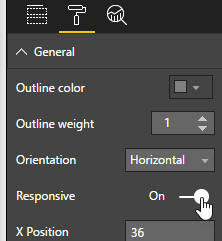 I would argue that this isn't a truly responsive slicer, since when you publish a report to Power BI Service the look and feel of the slicer doesn't alter as you resize your browser window. You can add a responsive slicer to phone layout. Here the slicer looks fairly normal. 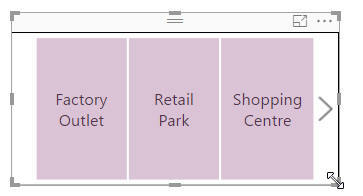 When viewing this report on a mobile phone, you can click on this slicer to choose (here) the centre type. Although this sounds a good idea, in practice it's not quite as smooth as I'd hoped (having just tried it in an IPhone) - you have to choose to Expand to focus mode, which is disappointing.